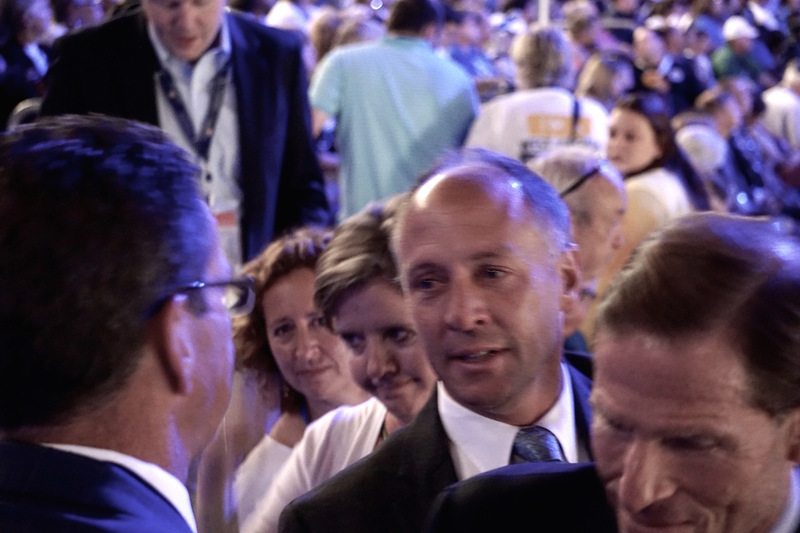 Mark Barden speaks with Gov. Dannel P. Malloy after Sen. Chris Murphy’s gun-control speech to the Democratic National Convention in 2016. Behind him is his wife Jackie. Mark Barden, a prominent gun-control advocate since the death of his son in the Sandy Hook School massacre more than five years ago, is weighing a run for Congress in Connecticut’s sprawling 5th District with the encouragement of the Democratic leadership of the U.S. House of Representatives. In a telephone interview Monday, Barden acknowledged making dozens of phone calls to the allies he has made in politics to quickly assess the personal, political and financial logistics of launching a campaign in April for an unexpectedly open seat — and what it would mean should he win. “I’m considering the impact on my family,” said Barden, the father of a 16-year-old daughter and 18-year-old son. His youngest, seven-year-old Daniel, was among the 20 first-grade students and six educators shot to death on Dec. 14, 2012, in Newtown, making the bucolic suburb the epicenter of a national debate over gun control. As a founder and managing director of Sandy Hook Promise, Barden has addressed Congress and met at the White House with two presidents, most recently in February with President Trump, to talk about policies that might prevent gun violence. His candidacy probably would attract national attention and contributions, while turning Barden into a more partisan figure. U.S. Rep. Elizabeth Esty, a Democrat elected to the seat a month before the school shooting, abruptly announced last week that she would not seek a fourth term in response to a hail of criticism over her mishandling of a complaint by a junior staffer that she was harassed and physically abused by Esty’s chief of staff, Tony Baker. On Esty’s recommendation, Baker was hired by Sandy Hook Promise after she fired him in July 2016. He no longer is with the group. Sources say U.S. House Minority Leader Nancy Pelosi, D-Calif., called Barden and urged him to run. Barden declined to share details of any specific conversation, but acknowledged being encouraged by the House Democratic leadership. He has consulted widely since then with everyone from Esty to U.S. Sen. Chris Murphy, D-Conn.
Barden, a composer and musician, has become a practiced spokesman on issues pertaining to gun violence, but he is untested as a candidate who will be confronted with a range of issues, ranging from taxation and tariffs to immigration. He would be following in the footsteps of Carolyn McCarthy, a nurse whose husband was killed and son wounded in the Long Island Railroad shooting on Dec. 7, 1993. When her representative, a Republican, voted to repeal the federal assault weapon ban, McCarthy unseated him in the 1996 election. McCarthy arrived in Washington as a single-issue candidate working for a cause that quickly faltered, but she eventually broadened her portfolio. Barden says he has heard McCarthy speak, but has not met her. After 18 years, she did not seek re-election in 2014, but predicted better days for the gun-control movement. Barden said broadening his own political interests might be welcome. “I’ll paraphrase my wife: It might be healthy for me to diversify my interest in issues,” Barden said. Former Simsbury First Selectman Mary Glassman, a Democrat who twice ran unsuccessfully for lieutenant governor, has declared her candidacy. State Rep. William A. Petit of Plainville, a survivor of the horrific home invasion that claimed the lives of his wife and two daughters, is among the Republicans considering a run. Nominating conventions are next month. Annual contributions to Sandy Hook Promise, a non-profit foundation founded by Barden and another Sandy Hook parent, Nicole Hockley, jumped from $2.89 million in 2013 to $5.46 million in 2016, according to the foundation’s 2017 tax return. Barden, the fourth-highest employee, was paid $89,914.